I would really love to make beautiful things from fabric, but I have to face the fact that paper is my thing. However, hanging a paper banner on our front porch is not very practical, so my daughter and I created a fabric fall banner this weekend. It was fun to make because we were doing it together, but it was definitely a challenge. Cut out 12 triangles from wool or felt in Fall colors. Pattern is here. 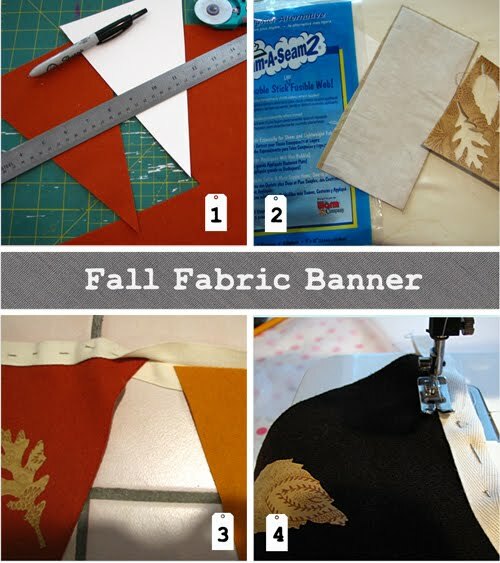 Iron scraps of fabric onto fusible webbing and cut out leaves using Big Shot and a leaf die. Peel off paper backing and fuse leaves onto the triangles with warm iron. Lay out triangles in pleasing pattern and pin to 1" twill tape that has been folded in half. Stitch felt triangles to twill tape leaving several inches on each end for tying. Here's how it looks hung on the porch. What a delightful banner! And what a great idea, to make it out of felt! Such simple outdoor fabric banners that really looks good on your porch. I'd love to have plenty of those for holiday celebrations and other simple gatherings. It's an easy project plus it really looks great.